ties for short periods. In the spring of 1885, the family moved to southwestern Kansas, but in 1888, returned to York county, Nebraska. They came on to Callaway, Custer county, in June, 1890, and Dr. Greer has since continued his practice there, although his interests have been broad and varied. He has been engaged in the drug business much of the time, and has also been interested in the stock business and real estate. He served several years on the town board of York, and, later on the board at Callaway, and is a well-known and popular citizen. He stands well in his profession, and has many friends in various circles. Six children were born to Dr. and Mrs. Greer: James A., married and living in Perkins county, has four children; Cora, who died in August, 1888; Harley E., married, and living in Perkins county, Nebraska, has three children; George N., married, and living in Callaway, has two children; Lydia K., wife of R. R. Barnard, of Callaway; Sadie G., wife of William F. Zumbrunn of Kansas City, Missouri. Among the highly respected residents of Howard county, Nebraska, who has always worked for the best interests of his county and state, and by his energy and push has helped build up the section to the thriving and productive region it has now become, we mention the name of Frank F. Rork as a leader. He has succeeded in accumulating a nice property for himself, having a fine two hundred and forty acre farm, which he occupies as a homestead, his residence being on section thirty of St. Libory precinct. Mr. Rork also owned a half section of land, five miles north of his home place, which he sold in 1910. Frank F. Rork is a native of Union City, Pennsylvania, born October 16, 1865, and was the youngest of his father's family of three children. His father, Patrick Rork, was a pioneer of Howard county, coming here in 1879, and purchasing homestead privileges on section thirty, township thirteen, range nine. After getting settled on the place, he sent for his wife, son and two daughters, and together they began the work of establishing a permanent home, going through the hardships and privations incidental to the life on the frontier in those years, but ever having in mind the hope of at last attaining success through energy and thrift, which has come to them in a large measure. They stuck to their claim, and gradually built up a good and comfortable home, the father dying on the homestead in 1890, and his wife surviving him for five years. One daughter is married, and now lives in Hall county, while the other, also married, resides in Loup county. Our subject has spent his entire life here practically, receiving his education in the local schools. He has followed farming constantly, after his father's death assuming entire charge of the home farm, on which he still lives. Mr. Rork was married in St. Libory on April 30, 1895, to Miss Kate O'Neill, who is a native of Wisconsin, and came to Howard county with tier parents, Hugh and Mary O'Neill, in 1894. They have an interesting family of nine children, all at home, named as follows: Frank, Raymond, George, William, John, Mary, Leonard, Elizabeth and Robert. Their home is one of the pleasantest ever visited, and is a hospitable spot to all who are fortunate enough to be among their acquaintances. During 1892, 1893 and 1894, Mr. Rork held the office of county commissioner, and has also held minor local office, being a populist in politics. Among the early settlers of southeastern Nebraska, who have been instrumental in the growth of the agricultural and financial interests of that region, a prominent place is given the gentleman whose name appears at the head of this review. He has always been found ready to further the interests of the community where he chose his home, and has gained a wide and enviable reputation as a worthy citizen and substantial agriculturist, having built up a fine farm and home in section nineteen, township twenty-seven, range four, Pierce county, his present location. Mr. Pilger was born, August 20, 1850, in Washington county, Wisconsin, and is the son of Peter and Elizabeth (Young) Pilger, natives of Germany, who were married in Wisconsin. In 1868, Mr. Pilger went from Wisconsin to Omaha, remaining there a year and a half, going thence to Franklin county, Nebraska, where he filed on a homestead in the Republican River valley. Bloomington, the county seat, was located adjoining his farm. There were but fourteen settlers in the county at the time of his coming. He resided here seventeen years, and in the fall of 1888, came to Pierce county, Nebraska, which his since been his home. He rented for several years in Pierce and Antelope counties, and bought his present place in 1895. He now owns two hundred acres of land. In Franklin county, Mr. Pilger lived in a dugout for five years, and then built a frame house. Kearney was the nearest market place, fifty miles distant, and for the first two years he had to make the journey to market and back by ox team. He "batched it" for nearly six years before finding a helpmeet to share his possessions and occupy the new frame house. Roy, who married Myrtle Abey, has four children, and farms in Holt county; Lottie, married Edward Samuelson, and lives near Wayne; Carl, who married Bertha Vosberg, and has two children, occupies the home with his father; Veta, married Burrell Wright, of Dixon; Fred, runs the Holt County Bank at Dorsey; Luella is a teacher of Pierce county; and Fern. Mr. Pilger endured his full share of the hardships and privations of the pioneer days, and, among other calamities, he suffered the entire loss of his crops for two years by drouth, and two years by grasshoppers. He was fortunate in being at home at the time of the bad blizzards. His son, Frank, was a mile from home on the day of the blizzard of January 12, 1888. He drove the cattle into a grove for water at noon, and was at home at dinner when the storm broke. Prairie fire once came near burning his residence. He plowed a fire guard, but the fire jumped over it, being extinguished, however, before, reaching the house. The town of Pilger, named for our subject's father, who settled in Stanton county in 1873, located on his farm. Mr. Pilger is independent in Politics, always casting his vote for the man regardless of the party. A prominent old settler is found in the person of the gentleman herein mentioned. Mr. Pischel has been closely identified with the history of the development and growth of Knox county, and the surrounding country, for forty years or more, during which time he has built up a good estate and home, and, incidentally, gained a good reputation as a worthy citizen and a progressive agriculturalist. Mr. Pischel is a prominent man in his community, and is postmaster of Pischelville post-office, to which office he was appointed by President Harrison in 1884. He also owns the Pischelville merchandise store, and resides on section twenty-six, township thirty-two, range eight, where he has lived since settling in Nebraska. Mr. Pischel is, indeed, an old-timer in every sense of the word, he having come here when but ten years of age. Mr. Pischel is a native of Bohemia, his birth occurring in the year of 1860, and he grew to the age of six years in his native land. In 1866, Mr. Pischel, with his parents, Anton and Maria Pischel, came to America, the father, like so many of the sturdy sons of foreign climes, having heard, the promising accounts of the new world, where fortunes were to be gained, and land was cheap. They sailed from Bremen and landed in New York in 1866. After reaching the United States, the family came direct to Chicago, where they remained four years, the father plying his occupation of merchant tailor. From Chicago the family came to Sioux City, and, took a boat up the river to Knox county, Nebraska, where they settled, taking up a homestead in section twenty-six, township thirty-two, range eight, on which land they built a log house, and, later, our subject took up a tree claim. Here the family lived the life of the early pioneer, but perhaps suffering hardships and losses to a greater degree than most people, as their advent to Nebraska occurred much earlier than that of the average old settler. Ox teams were the means of transporting to and from market in those times. In the first years of settlement, the grasshoppers destroyed every spear of the crops, which was not a very encouraging beginning. The Indians were a constant source of anxiety on the part of the very earliest settlers of this region, including our subject and the family, and were on the verge of outbreaks on several occasions. Deer and antelope were plentiful in those days, and could frequntly [sic] be seen browsing in the vicinity. In 1894, there was another total failure of crops, but which did not affect the family to such a great extent as in the first years of their settlement here. Mr. Pischel, as before stated, is a very prominent man in his section, and among the honors he has had conferred upon him, he served his constituency as county treasurer, being elected to that office in 1887, and also creditably held the office of county commissioner. In 1884, Mr. Pischel was united in marriage to Miss Theressa Deitz, and Mr. and Mrs. Pischel are the parents of eleven children. George W. Howe first set foot on Nebraska soil on entering Omaha in 1856 from Council Bluffs, to spend a week or ten days in the Nebraska metropolis, which at that time was merely a small frontier town. Two years elapsed before his next visit, at which time he came to Fort Randall, which was then in the territory of Nebraska, later being transferred to Dakota, and eventually becoming a part of the state of Nebraska. The greater part of Mr. Howe's career has been spent on the frontier, and he has had considerable dealings with Indians during earlier years. This is noticed in his manner of speech, which is slow and deliberate, and is a characteristic of their race. Minnesota, that state being opened at that time for settlement. He remained there during the winter, spending his summers on the farm in Iowa. As above stated, he came to Nebraska in 1858 for settlement, taking a claim in the northeast corner of Holt county, and so far as is known, was the first settler to prove up in that section of the state, his first proofs being made in 1871. He remained in the region of Fort Randall, part of the time in Dakota, and the balance in Nebraska, and also spent nearly one year in Montana. In 1864, Mr. Howe married a member of the Ponca tribe, and secured an allotment of two hundred and eighty acres in the Missouri river bottoms, a part of the Ponca reservatios [sic] in Boyd county, and each of his ten living children have since received an allotment of land. Mr. Howe's wife was a Miss Lucile Le Claire, whose father was a French fur trader, and their children are named as follows: Elizabeth, wife of Albert Frasier, who at one time was a missionary in the band ruled by Sitting Bull; Hannah, now Mrs. Charles Frasier, cousin of Albert, and engaged in missionary work in Tripp county; Edward Howe, farming in Boyd county; Alice, married, and living on the Ponca reservation; Arnold, with his sister in Tripp county; Ida, wife of Edgar Burton, a farmer of Bridgeport; Ben, of Verdel; and George J., living at home, a graduate of the Genoa Indian School, and local representative of the Mutual Life Insurance Company; John is next in order, and Rebecca, the youngest, is the wife of Daniel Ducker, and lives in Comstock, Nebraska. Since his marriage, Mr. Howe has taken a prominent part in Indian affairs, and is well versed in their mode of living, and the legends connected with the different tribes. At one time he was able to speak fluently in the Ponca and Sioux tongues. He was wagon master of the expedition under Inspector Kimball, when, in 1877, the Poncas were removed to Indian territory. At the time of the famous massacre at New Ulm, Minnesota, he was at Independence, Iowa, on a visit, and it was shortly after this time that the Santees were removed to Knox county, following their surrender. One of Mr. Howe's earliest recollections is a band of one hundred and fifty buffaloes on the reservation, and another of seeing a pair of them between Yankton and Bon Homme. He was hunting with a party of Indians near the confluence of the Big and Little Elkhorn, when the first settlers came through that section, seeking a location, and at this point Norfolk later sprang into being. The travelers were considerably frightened, but a white man among the band of Indians reassured them, and put them at their ease. Wild game was plentiful at that time, and the first to fall a victim to his gun was an antelope, which crossed Mr. Howe's path on a hunting trip through the country, where Bazile Mills is now located. For a time Mr. Howe held a license to trade with the Indians, and made use of the privilege to some extent. Mr. Howe was a member of the Odd Fellows while living in Iowa, but later, on account of nearly all his time being spent on the plains, he allowed his membership to lapse. Many sons from English soil have given of their energy and strength of purpose in helping: to build up what was some few years ago a barren and wild waste of prairie, and have endured almost incredible hardships and dangers in the doing. John W. Dover, the subject of this biographical writing, is one of those mentioned above, and after thirty-six years of varied experiences on the western frontier, is now amply repaid for his endurance and faithfulness to the state and county, where he chose his home many years ago. Mr. Dover resides on his fine farm, which is located in section twenty-four, township twenty-two, range one, west, Madison county, where he and his family enjoy the respect and esteem of a host of friends and acquaintances. Mr. Dover is a native of England, born in 1852 in Westershire, a son of James and Jane (Nicholson) Dover, also natives of England. The father was a Morocco leather dresser by occupation, and had plied that trade all through the years of his residence in his native land. Mr. Dover and his parents left their native country in the year 1865, sailing by way of Liverpool to New York, on the steamship "Jeremiah Thompson," and after reaching America, they proceeded to Delaware county, Iowa, where they located, and remained for ten years. In 1875, the family moved to Madison county, Nebraska, taking up a homestead in section twenty-six, township twenty-two, range one, west, and on this land built a good frame house. Our subject worked one year on the Craig & Clark ranch, when he first came to Nebraska. In the earliest days of settlement in Madison county, the Dover family went through many hardships and dangers. In the blizzard of 1888, our subject lost considerable cattle in the terrible storm of snow and sleet, a storm that will ever live in the memories of those who witnessed it, and as late as 1894, Mr. Dover suffered losses through the hot winds, which were occasioned by the terrible drouth that devastated the country. The nearest market places in the pioneer days were Columbus and Wisner, both being several miles distant. Deer and antelope were plentiful in those times, and could frequently be seen brousing around. Miss Susie Manning, and Mr. and Mrs. Dover are the parents of eleven children, whose names are as follows: Eva, Pearl, James, Grace, May, John, Myrtle, Susie, Roy, Lena and Lawrence. Mr. and Mrs. Dover and family are highly respected in their community, and Mr. Dover is well known throughout this section of the state as a substantial and progressive citizen, a credit to his home county. Joseph Sittler, who has a well-improved stock and grain farm in Custer county, is one of the pioneers of central Nebraska, having the respect and regard of a wide circle of sincere friends. He has long been identified with the upbuilding and development of his part of the state, and is recognized as an upright, useful citizen. He is a native of Wheaton, Illinois, his father having been a resident of Dupage county for a period of sixty years. Mr. Sittler was born, November 17, 1857, the fifth child of Oswald and Mary (Vogel) Sittler, who were parents of five sons and four daughters. He lived on a farm a mile and a half from Wheaton until reaching his twenty-first year, and received his education in the excellent public schools of his native state. The father still lives on the home farm, and there are three sons and four daughters now surviving, all being residents of Illinois, except Joseph, and one son who lives in Iowa, the former being the only one of the family to come to Nebraska. On July 3, 1878, Mr. Sittler came to Harvard, Clay county, Nebraska, making the trip alone. He first worked on a farm in that county, and, after remaining there six months, spent fourteen months in Douglas county. On April 17, 1880, he came to Custer county from Harvard, making part of the trip in company with Jacob Pence, who left him at Lee Park. Mr. Sittler came to the northwestern part of the county, Broken Bow at that time not being laid out as a town. He was one of the first settlers in the neighborhood, the other five being: William Corcoran, Andrew Sommer, Al Thomas, David Kinleyside and John Jacquot. Mr. Sittler secured a homestead on the northeast quarter of section twenty-five, township eighteen, range twenty-two, and also a timber claim on the northeast quarter of section one, township seventeen, range twenty-two. There was then only one log cabin in that immediate neighborhood, and the inland post-office was established at New Helena about that time, the mail coming from Loup City. For some time, their nearest trading points were Plum Creek (now Lexington) and Kearney, The early settlers in the northwestern part of Custer county did their trading at Grand Island, Hall county, procuring lumber and various household supplies. Mr. Sittler was married, May 1, 1884, on the Sommer homestead, to Amanda Read, the ceremony being performed by Judge Sommer, justice of the peace. Mrs. Sittler belongs to a pioneer family. Mr. and Mrs. Sittler lived on the homestead farm until 1888, and they have lived all their married life in Custer county. They have nine children living: Chauncey J., married, and resides in Merna; Cora Emma, Oswald H., Alma Leila, Adelbert W., Mabel Effie, Arthur E., Inez Mary and Clinton D., all natives of the county. The family now reside on the west half of section nine, township, seventeen, range twenty-one, where they have a well-equipped farm and substantial buildings. Mr. Sittler is one of the best known men in the county, and in years past has served as justice of the peace, and filled various other local offices. Lewis Mick, a prominent farmer, living on section thirty-three, township twenty-two, range two, east, is well known throughout this section as a progressive and successful citizen, who has done his full share toward the development of the community. He is highly esteemed by all with whom he has had to do, and well merits the high station which he holds. Mr. Mick is a native of West Prussia, and was born in 1865, the son of Benhart and Christina Mick, He received his education in his native land, and remained at home, helping his parents, until 1881. He had by that time come to the conclusion that America offered more opportunities to the average young man than were to be found any place else, so he came across the ocean to New York, and immediately made his way to the state of Michigan, where he remained for a little over a year. His next move was to Colfax county, Nebraska, where he worked for various farmers for wages until 1889. This was quite an important year for him in more ways than one. It was then that he was married to Miss Amelia Tiply, who has been a worthy helpmeet for him. Then, too, it was that same year that he came to Stanton county, and bought the farm which has been the family home ever since. He has added many improvements to the place since buying it, so that its value has been much enhanced thereby. He now has a comfortable and cozy home, very pleasantly located. Mr. and Mrs. Mick are the parents of three children: Christina, Hattie and Edward. They are prominent among the old settlers. In these days of peace and of correct orgnnization of the judiciary and other departments of the state, one reads as a chapter in a novel such narratives of happenings which befell the early settlers of the then new state of Nebraska. the cattle ranches of the West was a school that instructed men in the fundamental principle of "Live and let live" - if proven worthy - and of swift justice meted out to a culprit should he be found unworthy. He was, for a period of years, foreman on the Blow Ridge ranch, which was owned by W. T. Blodgett, of New York, and while in this capacity he formed the acquaintance of the woman who is now his wife, and who also assisted in the ranch work, she in the domestic economy branch of the service. He also had to do with the Marshall Field ranch and the Wichert ranch. On October 8, 1896, he was returning home from a trip, on which he had sold a load of hogs in the market, and while in the vicinity of the Wichert ranch, he was attacked and beaten by two ruffians, and while in an unconscious condition was robbed by them of his money and personal belongings. Neighbors assisted him to his home, and while he was lying in a subconscious condition, he could see, as does a clairvoyant, the actions of the robbers as they sat in a room of a deserted building, and divided the booty, and hid it in the recess of a chimney corner. So vividly impressed was he, that upon gaining strength, he started for the county seat to notify the authorities, and on the way met the sheriff, who returned with him, and, guided by the strange vision, he went direct to the hiding place, recovered the loot and turned the robbers over to the officers of the law, and so positive was the evidence in the court trial, that the malefactors were given penitentiary sentences. A picture of the family, as well is the family residence, appears on another page of this volume. 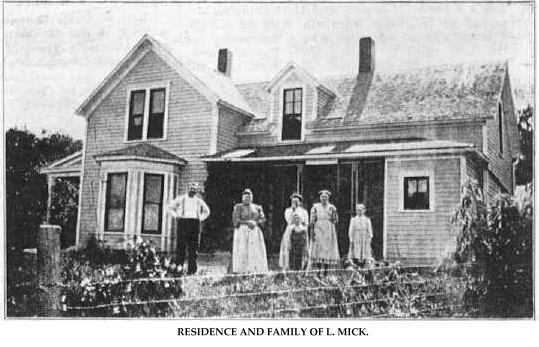 Residence and Family of L. Mick. Among the prosperous young farmers of Pierce county, Nebraska, the gentleman whose name heads this personal review deserves much praise for his strict attention to duty and perseverance in establishing a comfortable home and valuable property. Mr. Synovec is still a young man, but has already gained an enviable reputation as a worthy and substantial citizen of his community, and commands the respect and esteem of all who know him. Mr. Synovec is a native Nebraskan, born in Saline county, November 9, 1877, on the homestead of his parents, Frank and Antonia (Krumueller) Synovec, who were farmers by occupation, and emigrated to Saline county, Nebraska, in the early seventies, driving from Milwaukee, Wisconsin. Frank Synovec, our subject's father, was born in Bohemia in 1840, coming to America in 1866, escaping service in the Austrian army. He learned the machinists' trade in his native country, and was employed in a large brewery in Milwaukee to keep their machinery in order. He came to Pierce county in 1883, and died here in 1898. The mother, also a native of Bohemia, makes her home with her son. Our subject's parents came to America in a sailboat from Hamburg, Germany, to New York, being nine weeks on the sea. When settling in Saline county, the father built a sod house on the homestead, and later erected a log house. After living on this claim for some time, he sold his farm, and came to Pierce county, Nebraska, in 1883, and bought school land, where our subject now lives. This is now a well-improved farm of one hundred and twenty acres, five acres being set to trees. Theodore Synovec owns a quarter-section eight miles northeast of Valentine, in Cherry county. Mr. Synovec is a highly respected young man in his locality, and enjoys the friendship. and good wishes of a host of friends. He is a member of the Modern Woodmen lodge. Joseph Wichman, for the past many years one of the leading farmers and stockmen of Howard county, now retired from active labors, occupies, with his family, a comfortable home in the thriving little city of Farwell. Our subject and his good wife have the distinction of being the oldest married couple in the county, the former being ninety-five, while the latter is ten years his junior, and at this advanced age both are still enjoying good health, and take an active interest in the affairs of their community, numbering their friends by the hundreds, respected and loved by all. Mr. Wichman was born in Hanover, Germany, on June 14, 1816. He grew up there, served in the army, as compelled to do by that country's laws, and was married in his home city on October 28, 1850, to Miss Sophia Dalieon, who was born there on April 13, 1826. Two years after their marriage, they came to America, arriving in New York City on February 21. They brought with them one son, Ernest, born in Germany, and seven children were born here, five of whom are now living, as follows: Ernest, William, Joseph, junior, Annie and August, all married and settled in comfortable homes. Mr. and Mrs. Wichman have twenty grandchildren and five great grandchildren. to Howard county, arriving here in June of the same year. He immediately filed on homestead rights in section twenty-eight, township fourteen, range twelve, and then returned to Omaha to again do mason work, remaining about a year. In the spring of 1874, be came back to Howard county for permanent residence, occupying his original homestead up to October, 1905, when be and his wife moved into Farwell, where they own a comfortable home, and are surrounded by their children and many friends to cheer their declining years. Mr. and Mrs. Wichman have in their possession a bible printed in the German language, which was made especially for Nurenberg, the home town of Martin Luther. This book was published in the year 1545, and is six by eleven by seventeen inches in size, being the most valued possession of both Mr. and Mrs. Wichman. John Scott has lived on his Custer county (Nebraska) homestead since 1880, and is one of the best known men in the region, where he was one of the earliest settlers. He is a successful and prosperous farmer, well known for his energy and enterprise in furthering the best interests of his community, and has many friends. He was born in Ancrum, Roxburghshire, Scotland, January 30, 1856, oldest of the five children of George and Margaret (Purvis) Scott. He has a brother, David, living in Ansley, a sketch of whom also appears in this, work; a brother, George, in Wisconsin; one brother, deceased; one sister, Mrs. Jennie Jones, of Wisconsin. Both parents were natives of Scotland, where the mother died in 1866. The father came to America in 1867, sailing from Glasgow to New York in the "Columbia," the voyage lasting fourteen days. He settled in Wisconsin, and was for, many years engaged in the livery business at Janesville. He died in Columbiana county in 1904. When about eleven years of age, Mr. Scott accompained his father and the other children to America, and he grew to manhood on a farm in Rock county, Wisconsin, where he lived with an uncle for eight years, and was educated in the local schools. In the spring of 1879, he came to Howard county, Nebraska, and purchased eighty acres of land near St. Paul, living there one year, then in April, 1880, secured a homestead of one hundred and sixty acres of land on section ten, township seventeen, range eighteen, of Custer county which is still the home place. Mr. Scott is one of the prominent men of his part of the state and, having purchased the northwest quarter of section ten in 1904, now has a fine stock farm of three hundred and twenty acres of well-equipped and desirable land, where, in 1906, he erected a handsome, modern residence. Mr. Scott was married in Howard county, December 10, 1882, to Miss Hannah M. Garniss, a native of Canada and daughter of Henry and Ellen (Drury) Garniss, natives of England. The father died in Custer county in 1899, and the mother now lives in Ansley. One son, John Garniss, lives in Custer county, and a daughter, Harriet, wife of David Scott, lives in Ansley. The Garniss family have lived in Nebraska since they came to Howard county in 1877. Mr. and Mrs. Scott have had eight children, Scott, George H., William G., John D., Lee R., Margaret Ethel and Jewel T., at home, and one son, Elmer, who died in 1894. George H. married Addie Burham, and is farming northwest of his father; Lee is married to Marie Micheson and farms with his father. He has come into prominence of late as a professional wrestler, and under the tutelege of "Farmer" Burns gives promise of becoming a champion at the game. Mr. and Mrs. Scott have passed through the trials and vicissitudes of early days, and are highly regarded by their many friends. Mr. Scott suffered, with other settlers, by the drouth of 1894, and in the fall of that year, in order to meet family expenses, secured work with the Union Water company of Denver, near Fort Logan. Hail ruined his crops in 1891, and again in 1895, making it a period of great hardship and discouragement. Mr. Scott came to the county before big game was exterminated and killed many deer and antelope; on October 25, 1883, he killed two deer within a short space of time. The family occupied a "soddy" until 1906, which he erected a comfortable frame dwelling. Mr. Scott well remembers the blizzard of October 15 to 17, 1880, but was not out in it, having a sufferer from typhoid fever at that time. In the well known blizzard of 1888, along with most of the men of the county, he was at the Hickenbottom sale, and remained away until morning. Mrs. Scott went out to get water and fuel and in returning drifted past the house. Mr. Scott stood in the door shouting to her, or she would have been lost in the storm. In politics Mr. Scott is a republican, and serves his party as township central committeeman. He is a member of the Independent Order of Odd Fellows and the Modern Woodmen of America. Joseph Finkral, a prominent farmer and stockman of Madison county, Nebraska, is well known for his progressive and advanced methods of carrying on his work, and is highly successful. He is a native of Bohemia, born December 7, 1835, a son of John and Mary Finkral, farmers of that country, the former dying in 1867, and the latter in 1888. Mr. Finkral was one of four children, and was educated in his native country. In 1866 he left there and came to America in search of wider opportunities. After living seventeen years in Iowa, where he spent six years working on the railroad, in 1883 he came to Nebraska. He purchased improved land in Madison county, where he has since resided. He passed through the usual vicissitudes and hardships of the early settlers there, and has brought his place to a high state of productiveness. In 1894 he lost his crops through hot winds and in 1902 lost them through hailstorms. On January 12, 1888, the day of the big blizzard, Mr. Finkral lost several head of cows that were frozen to death. June 13, 1866, Mr. Finkral was united in marriage with Mary Witt, their marriage taking place in Baltimore, Maryland. They had come to America in the same ship. Three children have been born of this union: Anna, Joe and James. Mr. Finkral's home is on section twenty-eight, township twenty-two range three, and he is known throughout Madison county as a public-spirited citizen, being highly esteemed by all. He is interested in all that affects the welfare of his community and county and has made many friends in his adopted country. Mark E. Schneringer, a prominent and well known citizen of Callaway, is an early Nebraskan, and in 1883 became the first teacher of district number three, near Callaway. He was born in Lockridge, Iowa, November 5, 1858, youngest of the four children of Frederick and Rachel (Van Horne) Schneringer. In March, 1875, when sixteen years of age, he came with his brother Frederick to York county, Nebraska, and together they purchased three hundred and twenty acres of railrad [sic] land, where they carried on farming five years. Then Mark sold his interest in the farm in York county, coming to Callaway, securing a homestead west of where the village now stands, in section nine, township fifteen, range twenty-three. Mr. Schneringer was married in Callaway June 6, 1888, to Gertie Frazier, a native of West Virginia, who came with her parents to Custer county in 1887. In the spring of 1888, Mr. Schneringer moved to Callaway and for ten years was engaged in livery business there. In 1899 he was elected county treasurer, serving two years in office, and for the two years succeeding held the position of cashier of the Callaway State bank. He again entered mercantile life, and still conducts his business in that line, carrying hardware, furniture and undertaking supplies. In 1905 he erected a substantial business block, and he is one of the representatives and highly respected business men of the town. He has been closely identified with public affairs and is popular with his fellow citizens. He served five years as county supervisor and fifteen years as a member of the city board. He was instrumental in organizing the Callaway school district number one hundred and eighty, a sub-division of district number three, of which he was the first teacher. Mr. and Mrs. Schneringer have seven children: Elmer E. and Walter S., of Cozad, the former married; Herman, serving in the United States navy; Raymond, Earl, Warren and Eva, at home. Among the prosperous citizens of Pierce couty [sic], Nebraska, is Mr. John Millnitz, who has spent many years in this locality. Mr. Millnitz was born in Stettin province, Germany in 1874, but although Germany is his birthplace he spent only one year of his life there, his parents coming to this country in 1875. When they came to America, Mr. Millnitz's parents settle in the state of Wisconsin and from there, in 1876, came to Pierce county, Nebraska, where they settled between Pierce and Hadar, Nebraska, and lived there about three years. In 1879, the father took up a homestead in the northeast quarter, section twenty-nine, township twenty-eight, range four, Pierce county, Nebraska, and here our subject spent most of his childhood. Later, Mr. Millnitz' father took up a tree claim, which is located in the northwest quarter of section twenty-one, township twenty-eight, range four, Pierce county, Nebraska, where our subject now resides and which he now owns. Mr. Millnitz' father was August Millnitz, who was born in Germany and served his time in that country's army in the wars between Germany and France and between Germany and Austria. Our subject's parents and their family experienced almost more than their share of the losses and hardships encountered by the pioneers of Nebraska. Their nearest market place was Norfolk, Nebraska, and they hauled lumber from Yankton, South Dakota, to build their first house, and went to Columbus, Nebraska, to mill. They got along fairly well until 1890 when ten acres of their trees were damaged by prairie fire, which fire also destroyed their hay. In the year 1896, they suffered the most serious loss when their entire crop was beaten to the ground and destroyed by the memorable hail storm of that year. They also went through the blizzard of 1888. In the early days deer and antelope were plenty. Mr. John Millnitz, our subject, was united in marriage to Miss Mary Rehfeld in 1900, and they are the parents of five bright children, named as follows: Richard, John, Martin, Fred and Helen, all of whom attend the district school. Our subject was educated in public schools and also spent two years in the Plainview normal college. He is a member of the German Lutheran church, and in politics votes the democratic ticket.